Nothing is more evocative of Turkey for me than the sound of tiny spoons clinking into glasses at a Çay bahçesi (i.e. tea garden or cafe). The puppets sigh with hiraeth at this thought. They do pine for home now that they are home from their sabbatical! Nothing feels more like coming home then finding a spot under the Çinar ağaç (chinar tree) in the central square of the village on Bozcaada. Actually, it is more like a trapezoid, but whatever. This is my favorite café in the world, there is no doubt in my mind about this. While most people sip their tulip shaped glasses full of Çaykur brand tea, I favor two of the other drinks on the menu. First, there is island tea – Ada çayı – which is an herbal tea that tastes somewhat like sage but has a lemony flowery essence. I drink it with two sugars and a squeeze of lemon in a large glass fındık. Second, there is mastic-laced Turkish coffee, served with a tiny mastic almond cookie. Late at night, the café’s proprietor serves this with a cigarette and a shot of alcohol. Open year-round, this café serves up locally – baked goods such as eggplant börek – my favorite. 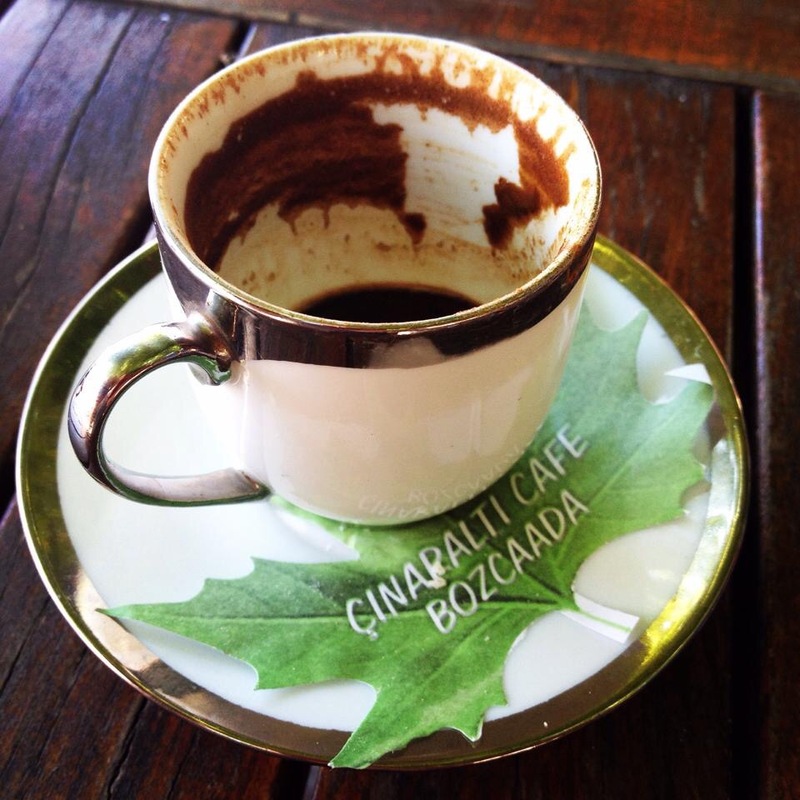 Enjoy a cuppa with the folks at Çınaraltı cafe any time of year! This entry was posted in Turkish destinations, Turkish Food!, Visits from the Karagöz puppets and tagged Ada çayı, Çaykur, Çinar ağaç, Çınaraltı cafe, çay, çay bahçesi, Bozcaada, mastic, mastic coffee, sakız, Türkiye, Tenedos, Turkey, Turkish, Turkish food. Bookmark the permalink. . . back in Paradise!